First of all if you haven’t heard of Joel Henriques and his blog, Made by Joel then you need to drop everything you are doing and go there immediately. Seriously! I love this guy’s projects. 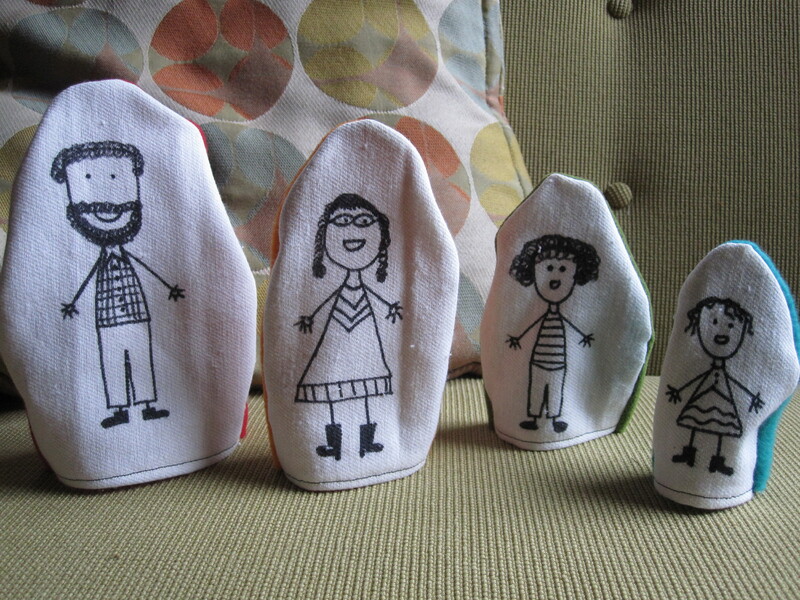 One in particular that looked, (and was) easy and lots of fun is his fabric nesting dolls project. I made a set for two of our closest family friends and one set for my youngest, but these won’t be the last that I do I can promise you that! It combined both sewing and drawing, two areas where I’m really hoping to expand my talents this upcoming year. 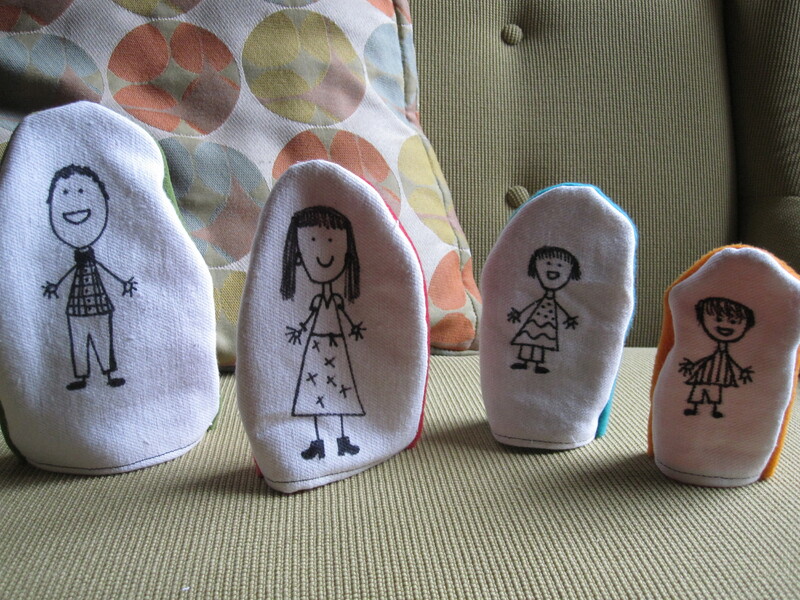 Drawing the little figures which I based on the actual friends I gave the dolls to, was such a kick! And the dolls themselves are very versatile. Since they stand on their own they can be moved as dolls or puppets. You could probably even turn them into game pieces if you wanted! I joked that people would think my 4 year old drew them, but everyone seemed to be able to see themselves in their doll. Pretty cool since I consider myself someone who can’t draw at all. I’m realizing that thinking of myself as such has been a major barrier and I’m hoping to really get over that in the next months. 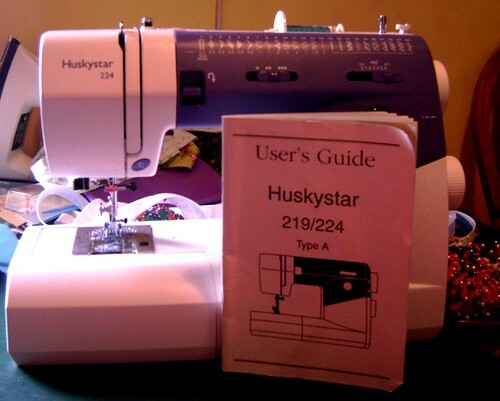 Hmmm… sounds like what I said two years ago when I decided to start this blog and teach myself to sew and now look at me! I’ve been selling my hand sewn clothing and accessories for almost a year now! 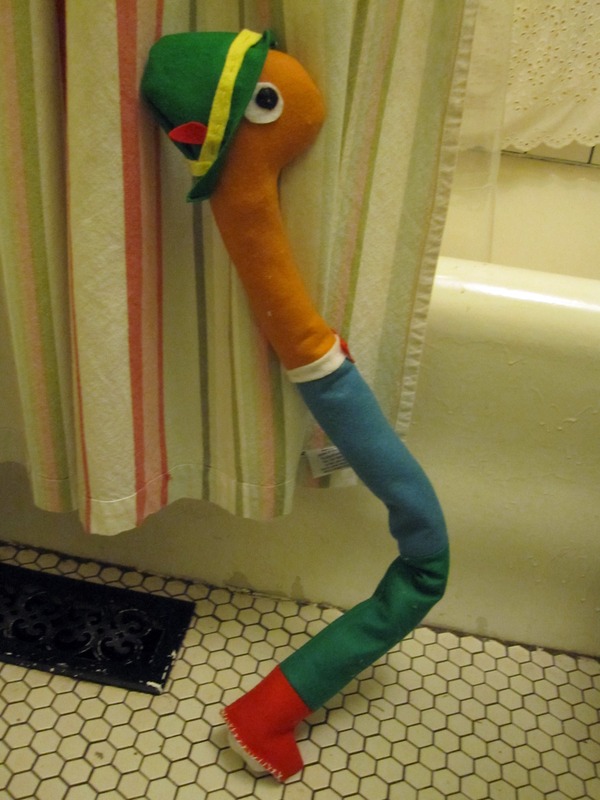 I also had a lot of fun making a Pippi Longstocking doll for PZ based on Laura Child’s illustrations and a Lowly Worm doll for PZ’s best friend E from the Richard Scarry books. 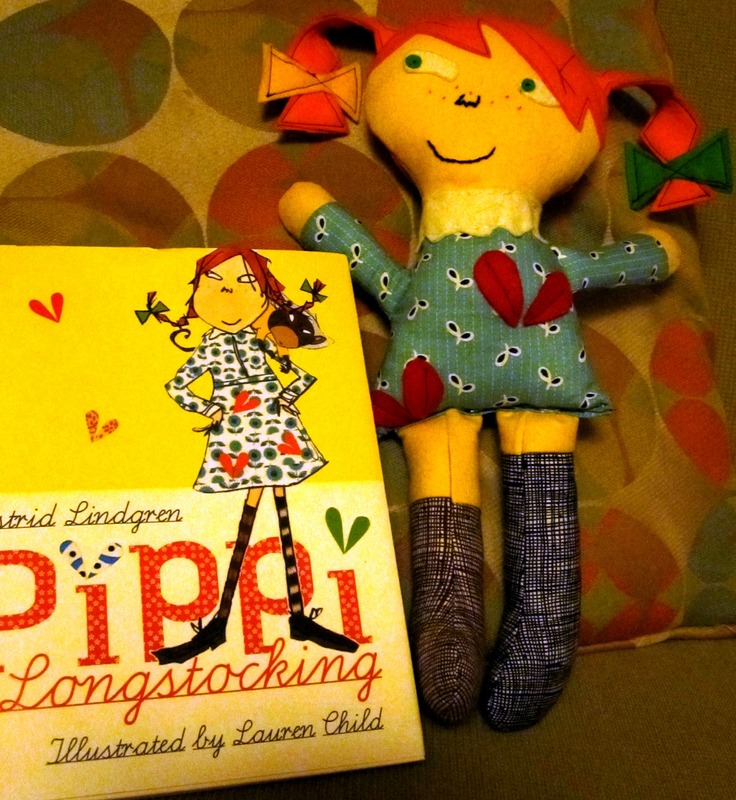 The Pippi doll I made using my own adaptation of the Tag Along doll pattern from Hillary Lang’s Wee Wonderfuls book. (Great book!) The body is some of my favorite fabric, Denyse Schmidt’s Flea Market Fancy. 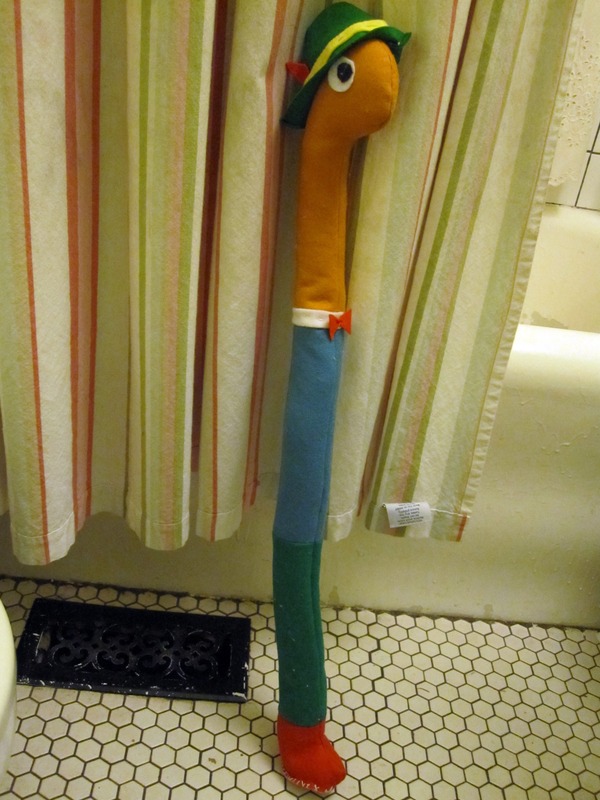 The rest of the body is made from wool felt that I got at Gossamer. I’ve been wanting to make one of these ever since I saw one as a giveaway prize on a blog (sorry, can’t remember the name!) 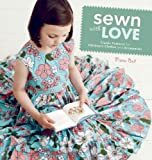 during last year’s Sew, Mama, Sew‘s Giveaway Day. It is super easy. I couldn’t find a tutorial anywhere, but it wan’t too hard to figure out. If you are looking for help on this one just let me know and I’ll try and dig up my numbers for this one. Hubs put a thick wire inside of Lowly so he’s super bendy and tough. Just perfect for a 4 year old little guy. I’ll have a post soon about what I’m hoping to concentrate on crafty wise for the upcoming year and a few projects I have floating around inside my noodle. Pretty crazy stuff in there, let me tell ya! Well, Hubs is tearing the tree down and the kiddos are running around like crazy so I better get back to it. Happy holidays! Well it’s not perfect, but… what a journey I’m on. If you’d have told me in January that I would make a quilt this year I probably would have laughed. Here it is though and I am so thrilled with it, wrinkles and puckers and all. Must Make Monday – It’s Summer, Tutes! We picked a ton of strawberries this weekend during our visit to Kruger’s Farm. I made a Strawberry Rhubarb pie from Smitten Kitchen that is divine. Yum! Next Saturday is the equinox folks. The true beginning of summer. So get out your flip flops, pour yourself some lemonade or better yet some strawberry lemonade slushie, and get ready to relax into some of these great summer tutorials. It’s summer, tutes! 1. Lee Meredith‘s How To Make a Two-Color A-Line Tee Skirt tutorial from Craftstylish. 2. 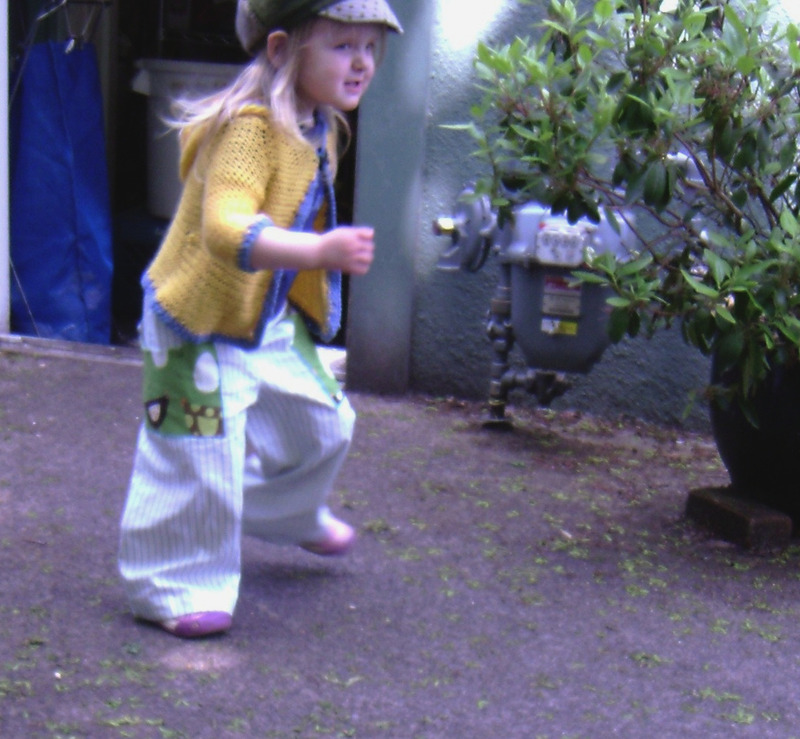 Cal Patch‘s How To Make a One-Pattern-Piece Reversible Sun Hat from Craftsylish. 3. Auborn Studio‘s Felt Strawberry tutorial at Mr. Monkeysuit. 4. 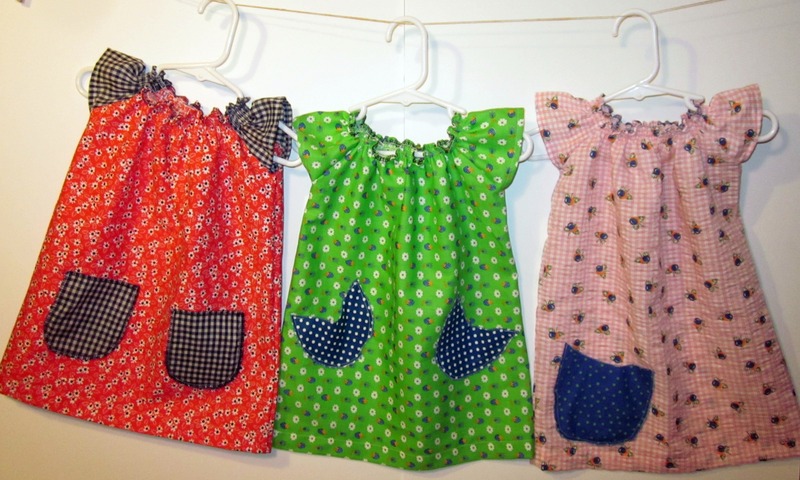 Mayaluna’s Summer Dreams Pillow Case Dress tutorial from maya*made. 5.Rachel’s Ruffly Headband tutorial at Heart of Light. 6. 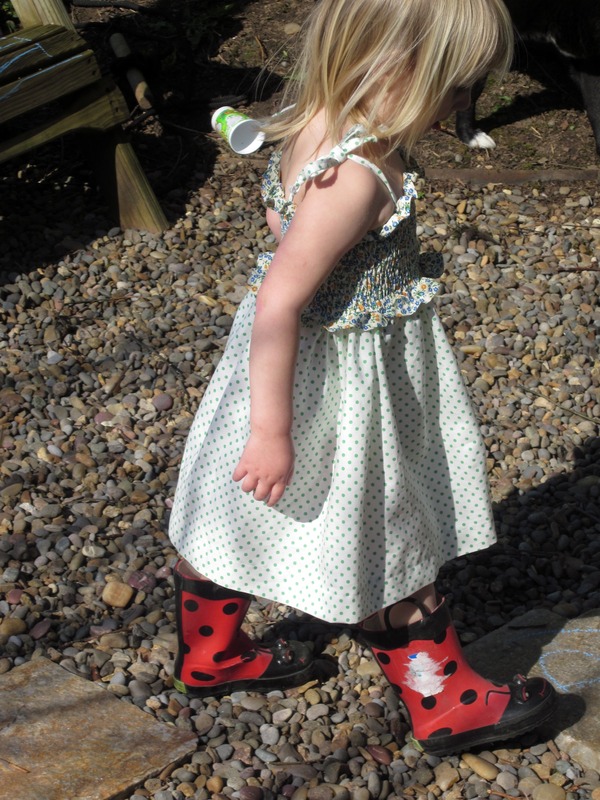 Beth’s Two Hour Dress/Tunic tutorial at Lula Louis. 7. LauPre‘s Easy Breezy Wrap Pant tutorial. 8. Ashley’s Getting Ready for Summer Beach Bag tutorial at Film in the Fridge. 9. Autumn’s Perfectly Portable Cushion tutorial at Sew, Mama, Sew!.